This article of Geeabo teaches you that How to Change WordPress Permalink Without Losing Traffic. Friends, as you all know that WordPress is one of the biggest platforms for running a blog or a website. When you started a blog, your permalink is set to default. Which is not an SEO friendly URL structure. So, changing the URL structure to an SEO friendly URL structure is always an important part for every blogger. So, before publishing an article or post on your blog, you must change your default URL structure to the best SEO friendly URL Structure. Now come to the point that How to Change WordPress Permalink Without Losing Traffic? Why You Have to Change WordPress Permalink? There may be few reasons behind changing the WordPress permalink. If You Want Better SEO – If you want to change the title and focus keyword of an article then you must have to change the permalinks too for a better SEO. And this is also an important tip to write an SEO friendly content. Due To Your Own Reason – Here, you change your permalink for any of your personal reasons. But friends, Whatever the reason is behind changing the WordPress Permalink but it is very important to Change WordPress Permalink Without Losing Traffic. Changing the WordPress permalink is not very difficult but Change WordPress Permalink Without Losing Traffic is a little bit tough. 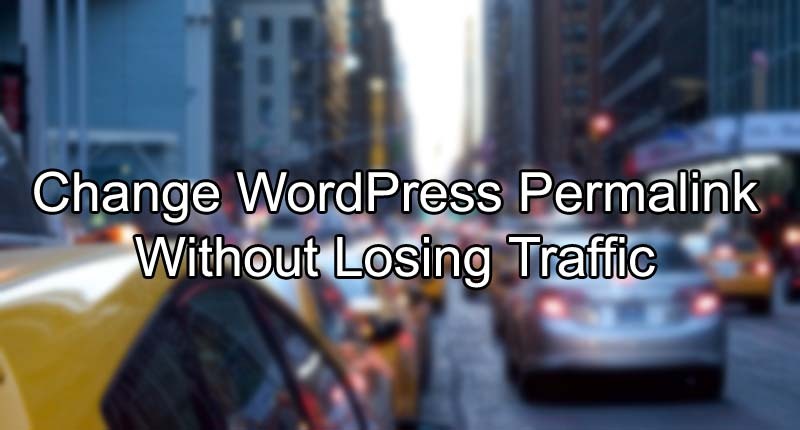 But here, I will show you the easiest way to Change WordPress Permalink Without Losing Traffic. Step 1. Login to your WordPress Dashboard. Step 2. Go to Plugins and click on Add New. Step 3. Now type Redirection in the Search bar. Step 4. Simply Install and Activate it. Step 5. After it successfully Activated, now go to tools and click on Redirection. Step 6. After clicking on redirection, it will show you an option to Add New Redirection. Source URL – Here you need to write your old URL. Target URL – Here you need to write your new URL. And in Group, Select Redirection. Step 8. Now click on Add Redirection Button. If you still want to ask something, please welcome. This will helps you a lot to change your existing URL to a new URL without losing traffic. Friends, doing any changes in URL is very dangerous for your traffic. But here I tried to give you the best solution to change WordPress permalink without losing traffic. So, this was the process to Change WordPress Permalink Without Losing Traffic.